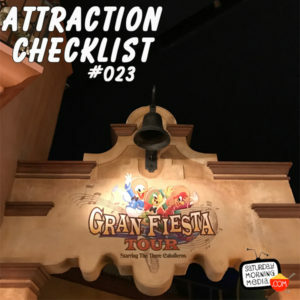 http://www.attractionchecklist.com – Let’s celebrate the sights and sounds of Mexico as John B. deHaas and I take a ride on the Gran Fiesta Tour Starring The Three Caballeros at EPCOT in Walt Disney World. Ride Audio Recorded on October 27, 2016. Today we head to EPCOT to experience the signature attraction of the Mexico Pavilion in World Showcase, the Gran Fiesta Tour Starring the There Caballeros! The guide map describes this ride by saying, “Discover the sights of Mexico and the antics of three feathered amigos on this boat ride.” There are no age or height requirements for this attraction and the Thrill Level simply describes this ride as a Slow Ride. Before we go out and search for Donald Duck with Jose and Panchito, here are five fast facts about this attraction! 1. The Gran Fiesta Tour Starring the Three Caballeros opened on April 6, 2007, replacing the Mexico Pavilion’s original attraction El Rio del Tiempo. The Gran Fiesta Tour keeps the same layout as the original ride but adds animated film sequences starring The Three Caballeros. 2. The addition of The Three Caballeros to the ride marked the first time that Disney made the, somewhat controversial decision, to add pre-existing characters into attractions in the World Showcase at EPCOT. A decision that has continued with Frozen Ever After in the Norway pavilion. 3. The voices of the Three Caballeros are performed by Tony Anselmo as Donald, Rob Paulson as José and Carlos Alazraqui as Panchito. 4. The center section of the attraction, known as the Festival of Children, features animatronics of singing and dancing children very reminiscent of It’s A Small World. This portion of the Gran Fiesta Tour is pretty much the same as it was back when the ride was known as El Rio del Tiempo. 5. On December 15, 2015, animatronics of the Three Caballeros were installed in the show’s finale. The animatronics were reused from the Magic Kingdom attraction the Mickey Mouse Revue which was closed to make way for Mickey’s PhilharMagic in Magic Kingdom’s Fantasyland. Now it’s time to ride the Gran Fiesta Tour. Along for the ride is John B. deHaas and after we ride we will give you our thoughts on this attraction. Also, this is a binaural recording, so if you have headphones put them on now as we head to EPCOT’S Mexico Pavilion to ride the Gran Fiesta Tour starring The Three Caballeros.